Keeping your Columbus air conditioning unit clean can help to maintain efficiency levels and prevent repair needs. It can also help the system last longer and improve indoor air quality. Because the condenser is part of the outside unit, it’s constantly exposed to outside dust, dirt, and yard debris; therefore, it is very important that you take the time to thoroughly clean the condenser coil and fan. Remember, before you clean any part of your AC system, always turn off all the power to the unit. Always start by ensuring that there’s nothing blocking the airflow to the unit. You may have to trim low braches or prune back bushes that are obstructing the airflow. Clear away any dead grass clippings, or weeds that have grown up around the unit. Once the unit is free of debris and dirt, clean the condenser with a professional coil cleaner, which should come with instructions on how much to use and where to apply the cleaner. Although some contractors recommend washing down the entire outside unit with a garden hose, you have to be very careful not to bend the fins. It’s best to use a specialized condenser cleaner and let it air dry. To clean the fins, you can use a dry, soft brush to remove dust and dirt. Remember to clean the fins carefully because they are bendable and damage easily. Straighten bent fins with a fin comb, which you can find at any HVAC supply store, or sometimes a hardware stores. Ask a professional if you aren’t sure how to use the fin comb. When your AC is not in use, keep it covered with the condenser cover that came with your air conditioning system. If you don’t have a cover that fits properly, call one of our Columbus air conditioning experts to help you find a replacement cover or one that will fit your particular model. Don’t use anything that could come off easily in inclement weather. Covering your AC unit in the winter will help prevent damage or corrosion. 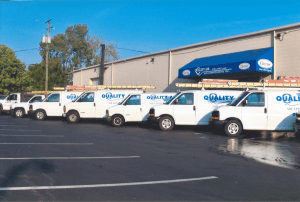 If you do happen to notice physical damage while cleaning your outdoor condenser unit, call Quality Air Heating and Air Conditioning so that we can send one of our HVAC technicians to assess the damage or make any necessary repairs.